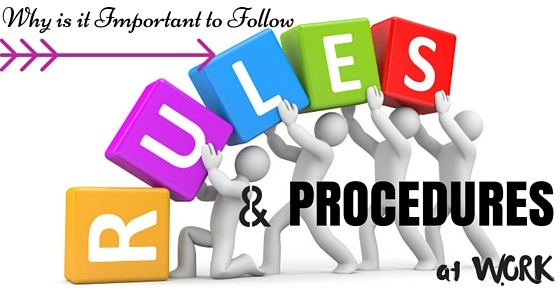 Why is it Important to Follow Rules and Procedures at Work? Rules and procedures are one thing which makes a company. After the manpower, it is the rules which define what type and how the culture of the company goes. If there would be no rules in a company to follow then there would have been lots of chaos and mess all around which would have only resulted in less than expected output. An organization can be defined simply by looking at their employees and the kind of work culture they are part of. Employees and Culture act as a mirror for your organization face. The organization usually imply few pre defined rules and policies at the work so that every hing moves on smoothly in a proper way. In simple terms, it is a set of rules defined by the organization that need to be followed by the employees and employers at the workplace. The employees need to follow the rules and policies while working for the organization. By implying such rules at workplace, there will be some kind of discipline and seriousness among employees which can result in greater productivity. This indirectly helps in the growth of the business. If the rules and policies are broken, then it will have a strong negative impact on the organization. Violation of rules can result in diminishing the culture and ethics of the organization. To get a more broader idea regarding importance of rules and policy at work, let us see what is a policy and procedure and the differences between them. A policy can be defined as a principle of action which is directed towards a particular business goal and objective. In simple terms, it is a plan of action that needs to be carried to achieve the goal of the organization through daily operations. In other terms, it is also a guideline about how employers and employees need to behave at workplace. Procedure can be defined as a clear step wise process to implement a policy. A proper procedure helps in clearing out all odds and obstacles arising while working on a task to achieve the goal. Both policies and procedures are the important elements that are required for performing the operational activities of an organization. Are Your Policies and Procedures Meeting Your Needs? Companies nowadays are not just a mere entity but they are more than that. Now companies and other organization breathe and live due to the rules and the procedures which bind the employees to follow. If there would be no rules, there would have been a mess all around and no one would know what has to be done and what not. So, to make sure everything goes well, it is important to follow the rules in the company. Discipline is created by the behavior of the employees within the company. But apart from that, the stern and the official matters cannot be handled just by the behavior of the employees. So, in order to keep everything in discipline, there is an utter need for everyone within the company to follow the rules and the procedures within the company in order to maintain the discipline. Without rules, the company would be like without limbs. If a man has no limbs, he or she won’t be able to work, similarly goes the same for the companies and the organizations. The company works with the authority of rules within it. No rules, no ruler or leader would be there and no cooperating environment would be created. So, in order to promote the cooperating environment within the company, it is important for everyone to adhere to the rules and procedures. Rules are made so that everyone is considered equal in the organization. If there would be no rules, everyone would do what he or she wishes to do and more of authority would be there than output. So, in order to get an output and to maintain equality, there is a need to follow the rules. By following the rules there is no subordinate and superior. Rules are for all and equal. So, to maintain the status of equality in the company, it is essential to follow the rules. In order to prevent any messy situation from taking place in the company, it is important to follow the rules. When everyone follows the rules, the harmony is maintained in the company as everyone follows the similar rules and it goes the same for all. So, if the company wishes to promote a good work environment within the organization, it is important to follow the rules and most important it is vital for every organization to set the strict rules and regulations. The company is run by the employees and if the employees themselves will not work as per the company norms then how will there be a common goal for all. The rules help set a common objective to be achieved by the employees working within the company. Every individual has their own goals but in order to make everyone work towards one common objective, it is essential to have rules as they help the entity to set equal goals that are to be achieved by the employees. The procedures and the rules within the company help in setting a fine tone for the work culture of the company. The entity without the rules is said to be having a bad and uncooperative work culture and no one wishes to work in that sort of the company. So, the rules also set the tone of the company’s culture and if they are followed accordingly, they assist in building a healthy work environment as well; hence attracting more skilled employees. It is important to follow the rules because due to the set rules, the work is done in a well-organized manner and the organized work always leads to the growth of the company as well as the employees. So, if you want to become organized and orderly, just make sure you are following the rules and working as per them. When you work as per the rules and the procedures, the work is done on time as the strict rules act as a stern teacher and guide. No work is left pending and all work is done in proper time. So, if you were a rule breaker earlier, then be one to make sure you are now a changed and orderly discipline person. As, following rules will help you complete your office work in time, leaving with no tensions and worries for the pending work to be completed. Through the adherence of the rules and procedures, everyone comes to know about their own individual duties and the responsibility which are indeed a good thing. Knowing your own duty that too by ownself is a great deal and makes a person self-responsible as no one is left to remind you the duties in the office hours. So, it not only reminds you of your duties and work but also makes one responsible human being. So, if you also wish to be one, then it is important to follow the rules and regulations as per laid by the company itself. Whatever is the company’s vision, is brought to life through the rules set by the company itself. If all the employees follow the rules properly, the company’s vision through their work is ultimately reflected and brings lots of respect and credibility to the company. So, following the rules is good for the employees as it automatically helps the company to grow by adhering to the regular rules and procedures. The rules within the company also set the limits for the employees. What employees are supposed to do and what not is all defined by the rules and the procedures of the company. So, it is important for all to follow the set rules and regulations as it will help you to know your limits for working and non-working. The limits are defined for all the levels in the organization and also sets the consequences which are good for the future of both the organization as well as the employees. The rules and the procedures also help in bringing the required change within the company if it has to bring in somehow. The company brings changes by comparing the previous rules and procedures. Whatever rule is not liked, is not carried forward further and whichever is liked is taken forward. By this way, the rules help in setting the rules and procedure for the future too. So, for this reason, also it is important for the employees to follow the rules as set by the company itself. By the rules, the varied nature of the employees is also known. This is because, through the set rules, the patience of the employees gets tested. The companies use their rules and procedures to test the real nature of the employees. So, if you really want you to put the best foot forward in front of the boss, then it is better to follow the rules and the regulations of the company without creating any chaos. Whatever activity is taking place within the company, is all covered or one can say the check is maintained on it with the help of the set procedures by the company. So, in order to keep an eye on day to day activity, it is important for all the companies to have proper procedures to be followed by the company as well as the employees. If the company functions without any set code of conduct, the company would not work for too long. Rather it will have a direct impact on it’s working and the output. But if the proper rules are followed, there is a proper code of conduct, the performance will improve as all the employees would work for a single common goal. No one would go in different directions to attain a goal. So, for improving the performance, the values need to form an integral part of the company. No company would stay in the market with chaos within, for a longer time. This is because there are companies which work with stern rules and values. Like if a company demands formal dressing within, the employees ought to follow that. If the employees do not follow the rule of proper dressing, it would ultimately affect the image of the company within the market. So, in order to make a company run in a smooth manner, the values need to be an important part of both the employees and the company itself. Every company needs to have the amiable environment and at the same time, it needs to be stern. Although every company says itself the best, yet not everyone is the same when it comes to market rating. So, if the companies wish to get an edge to compete with other companies at a time, it is essential to do something different by not forgetting to tread the path of strict rules and procedures. The company’s procedures help in projecting a positive image not just in front of the employees within the company but also to those who are outside the company. The positive culture within the company attracts more employees and also prevents the robust of the existing employees from the company. Also, it attracts many customers. A uniform enforcement of the customer service policies can help in the reassurance of the customers within the company. This is because they will come to know that what the company is heading to and they will also be benefited from the rules and the policies of the company. The rules and the procedures of the company help in setting the limits which further gives the warning and the caution to the employees as well as the external ones . The rules act as a savior to the individual especially the employees as they get to know their limits and the caution. They do not cross the limits which mean no breaking of the rules and this kind of attitude is always appreciates the company as it reflects the positive and the good working environment within the organization. The rules also help in knowing what is right and what is wrong which assist the company from drowning during the difficult times. As we have got a good idea regarding policies and procedures, let us have a look at some of their benefits as well. Ultimately, your organization wants you to be successful. Provide employees with awareness regarding expectations, ex: behaviour, performance standards etc. When implying rules, policies and procedures for a company make sure that they are based upon the type and size of the organization. So, above are some of the points which clearly explain why the rules and the procedures need to be followed by the employees as well as the company. whether it is a small scale organization or a large scale organization, you tend to follow the set rules. It will not only bring you out from the chaotic life but also teach many good things in life which will be helpful not only in personal life but also in the professional life.